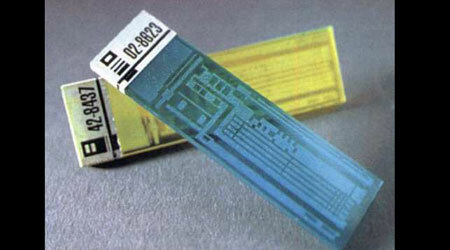 Isolinear optical chips are the standard data storage medium on Starfleet vessels. Isolinear chips are created from a single-axis optical crystal that is capable of storing 2.15 killoquads of data on each chip and has a built in independed nanoprocessor unit to manage data on the chip. Unlike earlier crystal storage devices, isolinear chips substrates are infused with trace amounts of superconductive platinum and irridium to permit FTL processing when inserted into a starship s main computer core, which results in a 335% increase in processing speed. When an isolinear chip is intended for use outside a computer core it is coated with a tripolymer sealant to allow the chips to be handled without protective gloves. These chips also make data portable between systems a nd can be used in PADD devices and tricorders.